We were getting many mails regarding recharge giveaway once we had on our facebook group. We are starting our first Giveaway of 2012. Its very easy to win. All you need to do is to Login with Facebook below or enter name and email id. Complete the tasks and enter into draw. More entries means more chance of winning. So Guys Pull up your sleeves and start winning. 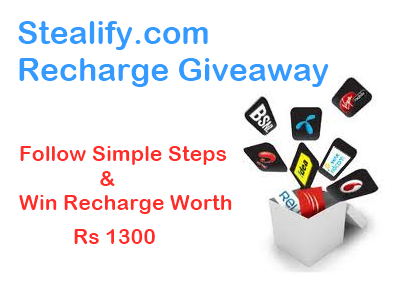 Recharge for Rs 100 or More and Get Rs 25 off on Next Recharge. RechargeFree.com is a new website similar to Freecharge.in. They are running a New Year Bonanza offer where they are giving 25 Rs off on your next recharge. Read the Terms and Conditions below before recharging your mobile phone. 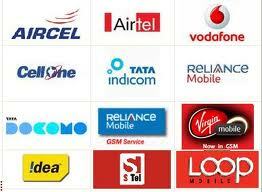 Recharge for Rs.100 or More & get Rs.25 worth of FREE RECHARGE on your next Recharge. This offer is Valid Till 31st January 2012. Discount coupon would be delivered instantly to your E-mail. This Offer can not be clubbed with other offers. Enter all required details and recharge. You will get coupon instantly. The Body Shop - Second largest cosmetic franchise in the world is running a promotion on Facebook where every Fan of The Body Shop India Facebook Page will get free two samples of their cosmetic product. The body shop has over 2,500 stores in more than 60 countries, selling a range of over 1,200 products Ethinic,Original, Natural Cosmetics & Toiletries, all 100% vegetarian and animal-cruelty free. How to Get two samples of Cosmetics from " The Body Shop India"? Click here to go to The Body Shop Facebook Page and Like the page. On welcome Tab, Fill out the form. Terms & Conditions of "The Body Shop Free sample Campaign"
The Facebook Fan is entitled to pick up his/her Free Sample Product only from the 'Nearest The Body Shop store' as entered in his/her form. Store available in Amritsar, Chandigarh, Delhi, Gurgaon, Noida, Jaipur, Kanpur, Lucknow, Ludhiana, Bhopal, Indore, Banglore, Chennai, Hyderabad, Maglore, Mysore, Coimbatore, Ahmedabad, Aurangabad, Mumbai, Navi Mumbai, Nagpur, Pune, Vadodara and Kolkata. Nirula's is giving a free Hot Choclate Fudge on registration on facebook fan page. This offer is only for Delhi readers as you need to visit Nirula's Defence Colony outlet to get this free icecream. Read Steps below to know how to get this deal. 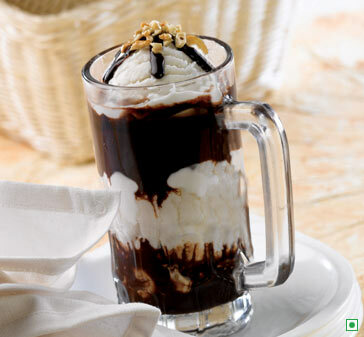 How to get free Hot Chocolate Fudge? Enter your mobile number, Email Id & Click submit . Enchanteur Perfume Free Sample - Facebook Page. How to get Free sample of Enchanteur perfume? Now you can have real glowing skin in just 15 minutes! Make your skin come alive with Free Neutrogena’s Fine Fairness Deep Whitening Mask. 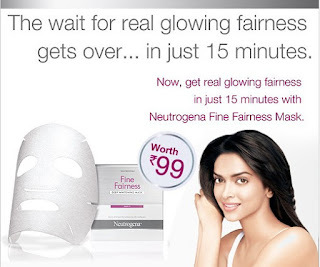 Neutrogena is offering free sample of this new Fairness Mask for free to every Facebook fan worth Rs.99. How to get Neutrogena Fine Fairness Mask for Free? Now Click here and hit Play button. Watch a Short Advertisement for 18 Seconds, then you will get an option to order free sample. Click on Free Sample link and allow requested permission. Enter all the required details like shipping address etc. That's it. You will get the sample delivered at your doorstep. 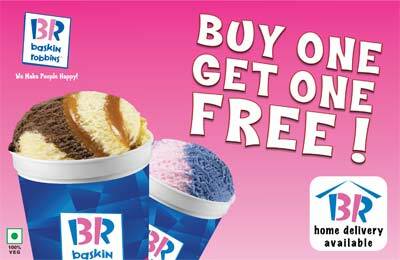 Now you can enjoy 2 Baskin-Robbins ice cream at the price of 1. Snapdeal is running a offer where you can get buy one get one at Baskin Robbins by just paying Rs 25. Read to know more about this deal. Click here to go to Snapdeal offer Page. You will get a Buy one Get one Voucher in your mail & Sms. 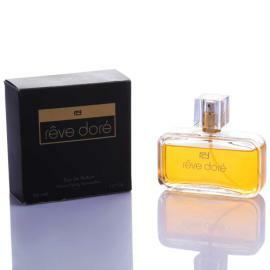 Yebhi.com is giving 90% off on Reve Dore Perfume. This deal is more than a steal as the MRP of this perfume is Rs 999. Read on to know how to get this Perfume at Rs 99. How to get this Perfume at Rs 99? Note: This coupon code is valid once per Yebhi Account.